The ancient Galactic Realm, ruled from the Core Worlds of the galaxy, is waning. The barbaric kingdoms that lie beyond the galactic frontier are now amassing their strengths, choosing this pivotal moment to strike at the heart of the fading republic. They strive to establish new Empires build upon the ashes of decaying civilizations. 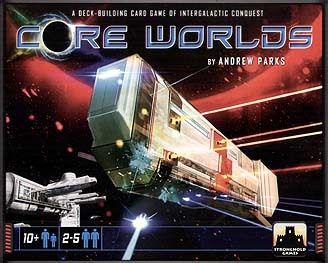 In Core Worlds each player controls a barbarian Star Empire represented by many cards. Throughout the game players will invade Worlds and draft new Units and Tactics into their Empires. The player who best manages their Empire will lead the conquest of the Core Worlds at the centre of the galaxy and win the game! Core Worlds is a deck-building card game for 2-5 players, with art by magnificent sci-fi artists Maciej Rebisz, Alex Figini, Timothy Rodriguez, and more! With over 200 cards to add to their Empires, players will explore and conquer a new galaxy each time they play!